spend what is expected to be the highest price ever paid for a bottle of beer! 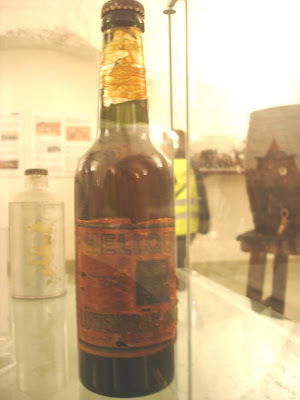 A singed bottle of beer recovered from the ashes of the Hindenburg disaster is expected to fetch $4,000 to $8,000 (£3,000 and £5,000) at auction this weekend -- the highest price ever for a bottle of beer. 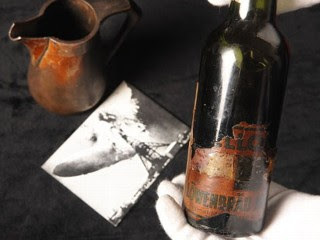 Though most of the 62-year-old suds remain in the bottle, auctioneer Andrew Aldridge said the contents of the Lowenbrau bottle, discovered by a New Jersey firefighter in 1937 at the site of the airship's historic disaster, are undrinkable. "It is the most valuable bottle of beer ever sold," said Aldridge of the British auction house Henry Aldridge & Sons. "But you wouldn't like to drink it, let me put it that way. It would taste putrid." The Hindenburg, an enormous passenger-carrying hydrogen-filled German airship, over Lakehurst, N.J. ...It's burst into flames! It burst into flames, and it's falling, it's crashing! Watch it! Watch it! Get out of the way! Get out of the way! Get this, Charlie; get this, Charlie! It's fire... and it's crashing! It's crashing terrible! Oh, my! Get out of the way, please! It's burning and bursting into flames and the... and it's falling on the mooring mast. And all the folks agree that this is terrible; this is the one of the worst catastrophes in the world. [indecipherable] its flames... Crashing, oh! Four- or five-hundred feet into the sky and it... it's a terrific crash, ladies and gentlemen. It's smoke, and it's in flames now; and the frame is crashing to the ground, not quite to the mooring mast. Oh, the humanity! and all the passengers screaming around here. I told you; it—I can't even talk to people Their friends are out there! Ah! It's... it... it's a... ah! I... I can't talk, ladies and gentlemen. Honest: it's just laying there, mass of smoking wreckage. Ah! And everybody can hardly breathe and talk and the screaming. Lady, I... I... I'm sorry. Honest: I... I can hardly breathe. I... I'm going to step inside, where I cannot see it. Charlie, that's terrible. Ah, ah... I can't. Listen, folks; I... I'm gonna have to stop for a minute because [indecipherable] I've lost my voice. This is the worst thing I've ever witnessed. 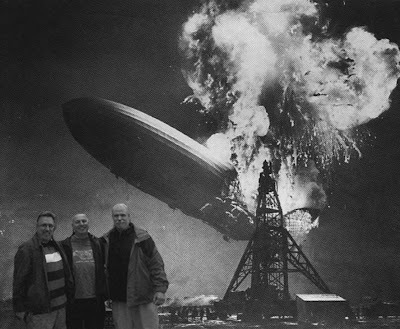 The Hindenburg disaster on May 6 1937 claimed 36 lives after the LZ 129 airship caught fire. 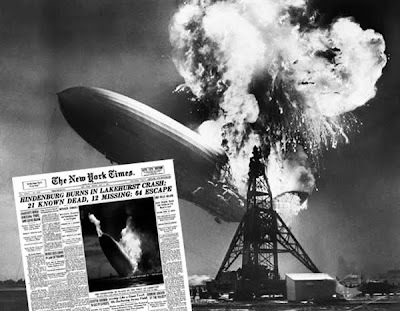 The Hindenburg, which had 97 passengers on board, was destroyed within a minute while attempting to dock with its mooring mast at the Lakehurst Naval Air Station, in New Jersey, United States. "About 20 percent of the beer evaporated from the bottle. Some of the label is still intact and you can make out 'Lowenbrau' and 'Munich.' The label is heavily browned," said Aldridge. The fire-damaged bottle of Lowenbrau Beer was taken from the wreck site by Fire Chief Leroy Smith of the Matawan Fire department, New Jersey. The bottle being auctioned was presented to the Lowenbrau brewery museum in 1977 and is now sold with correspondence from the brewery in Munich, press cuttings and an account of how Mr Smith came to acquire it. In it he said: "The Zeppelin Hindenburg flew over our town, it was a fantastic sight. A few hours later we heard the sirens. "I saw a pile of broken glass and as I looked closer I found a few bottles of beer. I took six, one for each member of our group. Last year one of the men died and I got the bottle back." Here, Sir Hook, Sir Dayvd, and Sir Bowie traveled back in time to witness the landing. P.S. I thought turkeys could fly, too (just wanted to beat WKRP fans to the punch). I'm surprised the Fire Chief didn't drink it and then kept the bottle. Truly not a Knight! All this Time Travel is wearing me out. Don't you know that according to Sir D, it's not possible to live in the past in the present?! LOL! We're like the commercial showing the guys in a Ford truck going back in time to witness the birth of sports traditions. ah ...like the Guy Fawkes Lamp.... a tangilble relic of an historic tragedy. Mind you if us knights had been there we would have broken out the Fireside Nut Brown ale, and baked a few potatoes, cumberland sausages, some Crumpets and some Marshmallows on the embers....even let off a few bottle rockets.. I mean, its burned....it ain't going back up....life gotta go on.. its the Now that shapes the Now.